A super cool material – the crystal structure of Krypton. The first of our requested crystal structures, well nearly… On twitter we asked ‘What crystal structure would you like to see blogged about’ and our friends @Aus_ScienceWeek asked for Kryptonite. OK, if we had access to kryptonite (of the green variety) I’m not sure we’d be doing crystallography, we’d be finding other ways to save the world. But how about the element Krypton, that’s close, right? Krypton is a noble gas, and so not something we tend to think of as a solid crystalline material. Like the other noble gases, argon and neon to name a couple, they have full outer shells of electrons, no room to accept any others and none to give away for the formation of bonds with other elements. In fact the first compound with a noble gas wasn’t discovered until 1962. It’s this full shell that makes the noble gases pretty unreactive; they like to sit on their own being, well, nobel. This unreactivity makes them pretty useful for creating neutral environments to play with other materials. Lots of gloveboxes will be filled with argon, and lightbulbs will often be filled with neon and other noble gas mixtures. But what if we cool it down? Krypton will become a liquid at about -153°C but only stays liquid for a very narrow window as it will freeze to a solid at -157°C. Solid Krypton is an example of a hexagonally close packed solid, the other most efficient way of pack spheres to cubic close packing (the structure that gold takes up). 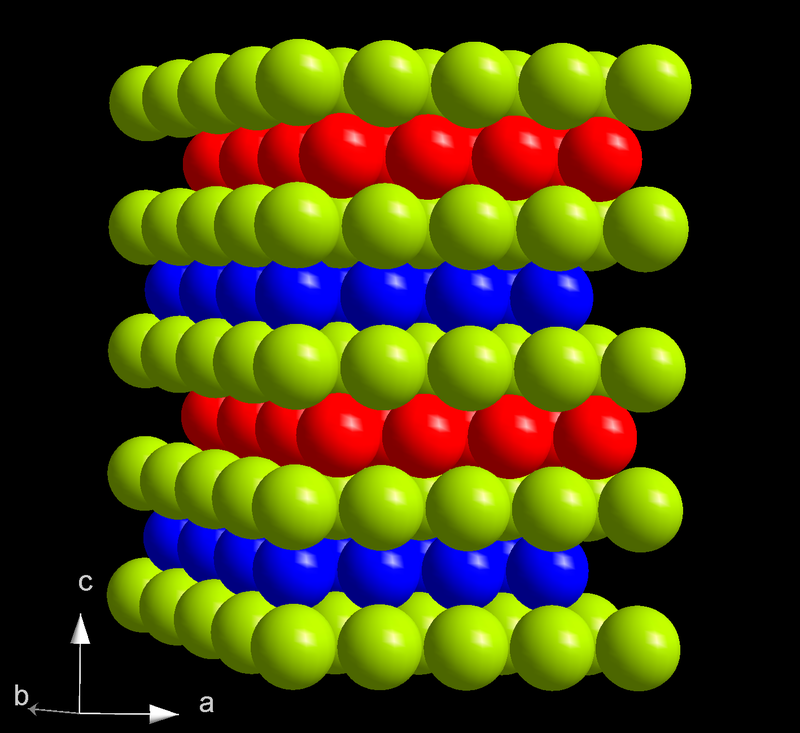 This krypton structure is #9012404 in the open crystallography database. 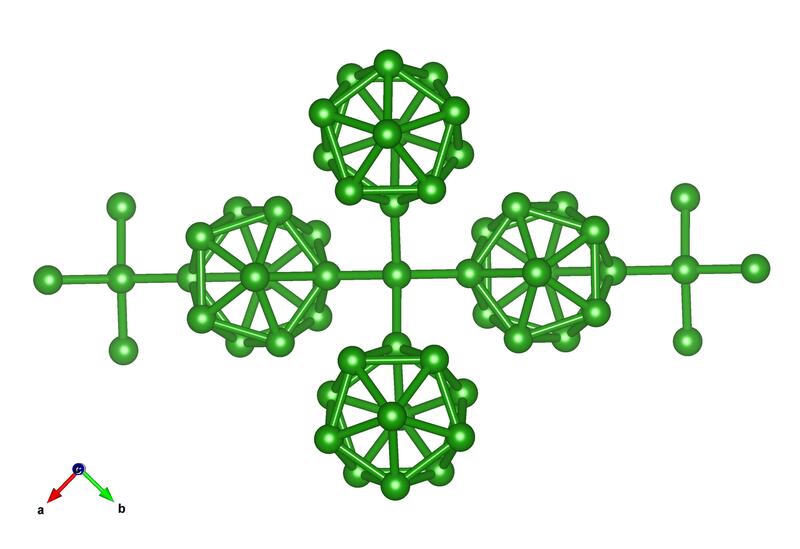 The double hexagonal close packed structure of Curium. Today would have been Marie Curie’s 147th Birthday. It’s also medical physics day in honour of the fact that her discoveries lead to the the way we treat many types of cancer with radiation. Marie Curie’s accolades are well known, amongst other things she was the first person to win both a chemistry and physics Nobel prize. We’ve actually already covered the curious crystal structure of one of the elements she discovered, Polonium, so instead today we thought we’d cover the element named after her and her husband, Curium. Curium was first intentionally synthesised in 1944, using a cyclotron at the University of California. It’s the heaviest of the actinide elements that you can make milligrams of, anything heavier only exists for long enough for a few atoms at a time to exist. Curium it thought to form a couple of crystal structures, the one we’ve shown here element structure that we haven’t featured on crystallography 365 yet, a double hexagonally closed packed structure. This means that it forms a layered structure, one repeats (the yellow layer in the picture) and in between that two other types of layer (red and blue) form in between that. Nobody has ever really made enough curium to do a diffraction study of it, so the structure has been determined from ab initio theory methods by Milman et al in 2003. You can read more about how they did this in their paper. Future Boron: Virtual Synthesis is the Next Phase. It’s an allotrope of Boron. Maybe. In a previous C-365 blog episode, we described an allotrope of Boron that was discovered in 1951. And when we say “discovered” we mean “someone found a crystal, measured it and did the crystallography”. 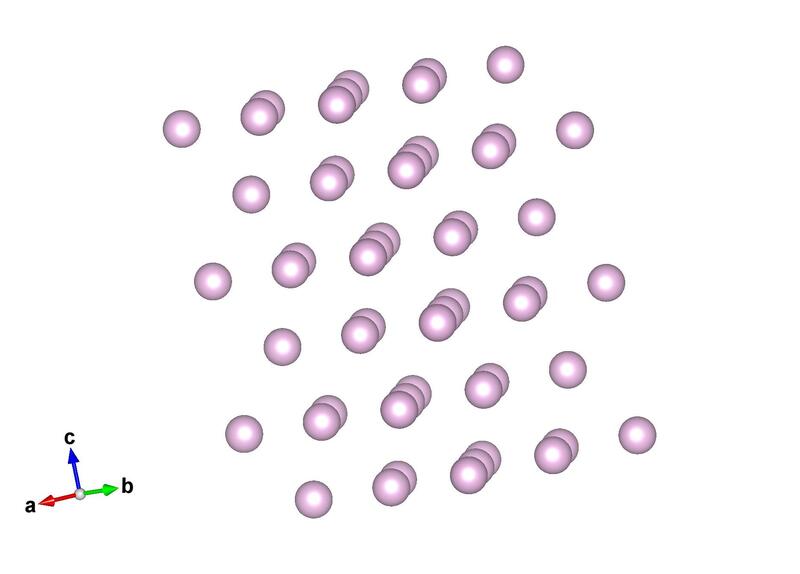 The cubic B56 structure shown above is a high pressure phase described in a recent open access paper. The catch? No one knows if it actually exists or not. The structure is one of a number “hand created” using some plausible hypotheses and then computer modeled using density functional theory to see if it was “stable”. The “in the box” synthesis of computational chemistry is not new, but in another example of how the world has been changed by Moore’s Law, has become a routine part of the chemist’s toolbox. Still, as the old saying goes, a computer can make more mistakes in a day than you can in a lifetime. When engulfed in fire and brimstone, have you ever wondered what brimstone actually is? Well in this context it’s referring to sulfur – with all the negative connotations that this yellow, smelly substance has. We’ve already featured one allotropes of sulfur, the S10 rings. But as we explained back then sulfur is probably the element with the most different ways of packing itself in a crystal structure – many have been discovered so far! Many of the sulfur structures are composed of rings of sulfur atoms – today’s is no exception to this. Instead of rings of 10 sulfur atoms, here we have the more common form rings of 8 atoms. This structure we’ve featured today is that of alpha-sulfur, which was first reported by Coppens et al, we obtained the CIF (which is hosted on the Inorganic crystal structure database) through the chemical data service (CDS) links on this page.